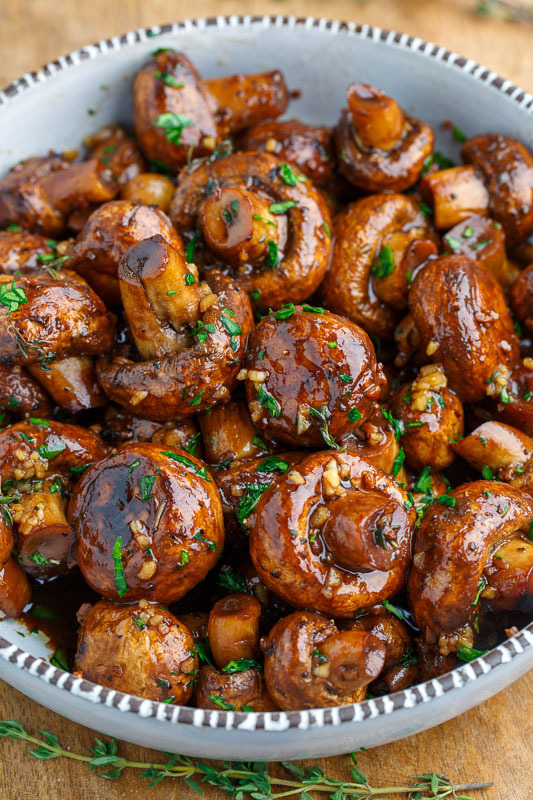 Simple and tasty mushrooms roasted in a balsamic-soy and garlic sauce! 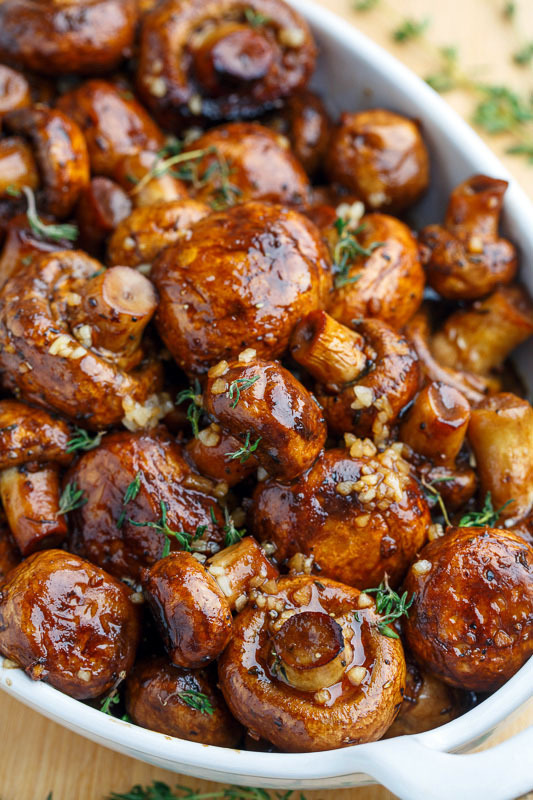 Today I have a new side dish recipe for you, balsamic soy roasted garlic mushrooms that are so easy to make and so tasty and good! 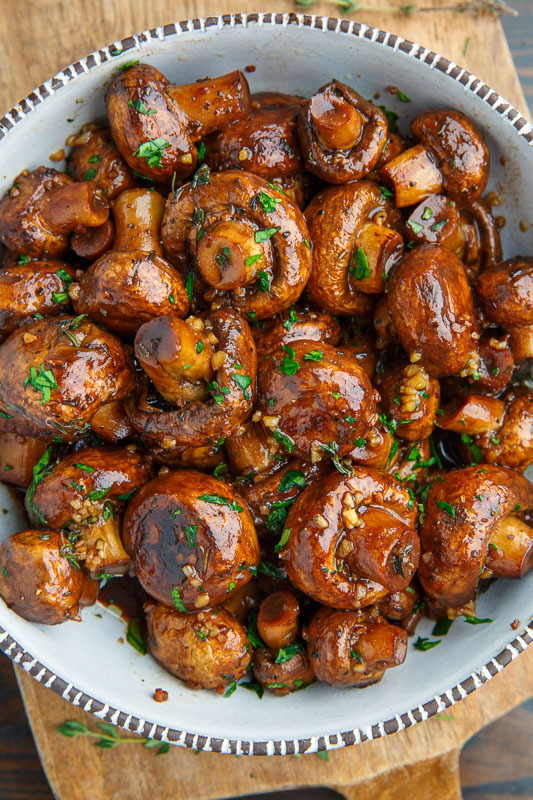 These mushrooms are as easy to make as tossing whole mushrooms in soy sauce, balsamic vinegar and garlic and roasting them until they are all nice and tender! 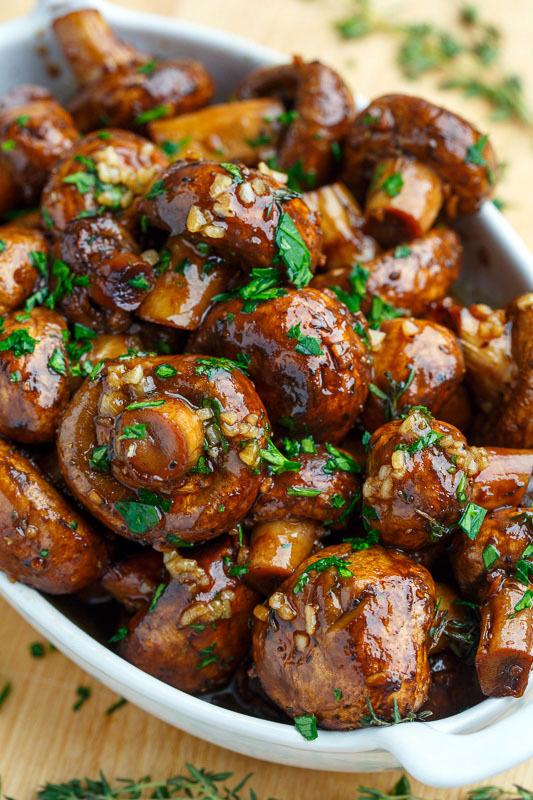 Despite being so simple, these mushrooms are going be the star of your next meal! This would be the perfect side dish for pretty much anything! You always have a way with mushrooms! I judge a cook on the way they prepare them. Delicious. Guess who's buying mushrooms tomorrow! Can't wait to try this. This dish is all I need for dinner! I tried this last night. The flavor was very good. I actually cut the recipe by 1/4 and made it in too big of a dish…as a result my results didn't come out as coated in sauce as yours did. Next time I would make at least a 1/2 recipe and try to find a smaller dish so the liquid stays touching the mushrooms. That sauce is just the star of this recipe! Side dish, are you crazy, this wonderful creation is a complete meal in itself….show me the mushrooms! Dave Harris: Yes! I could eat this as a main as well! Just made these to serve with today's Christmas dinner. Let me just say if you haven't made these yet, make these part of your 2017 menu, amazing! Hey Kevin, have you ever thought about moving to Florida and finding a little old lady to cook for? These mushrooms are beyond fabulous. Just like every other recipe of yours that I've tried. Wow! Thanks so much for sharing your talent with us. And my kitchen's yours whenever you're ready! Tried these tonight. 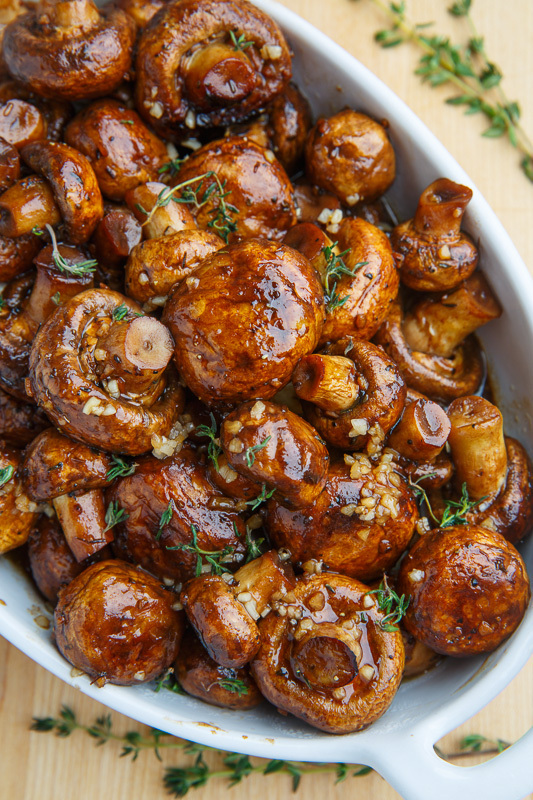 While the family enjoyed them, they enjoyed your recipe for "Roasted Mushrooms in a Browned Butter, Garlic and Thyme Sauce" even more, so those will stay at the top of the list, LOL. Thanks for the great recipes! I made these to serve with roast beef tonight and they were outrageously good! Thanks for a keeper of a recipe,Kevin. jennybwilde: I'm glad you enjoyed them! They are go good with roast beef! These were the best mushrooms I have ever had! We just had fondue night and if you thought couldn't get better all by themselves, try a little fondue cheese. Thank you for the receipe! These recipe was Delish. Made a 1/2 portion yesterday to use up some mushrooms. Reheated for dinner tonight and served with some angel hair pasta. Awesome flavor !! I cooked about 30 minutes (my oven often takes longer to cook though), enough to ensure that they caramelized and the liquid started to reduce. Thanks for a great recipe ! Cherie R.: I'm glad you like them! Could you use liquid aminos in place of soy? We just had these delicious mushrooms for supper. I must admit I was a bit sceptical about the amount of sauce so I doubled it. Turned out the recipe would have been correct because the mushrooms released some juices during their time in the oven. This was a great main dish along with some crusty rolls and a green salad, but I could also imagine it as a delicious side for a barbecue. Thank you for this recipe! Looks so good. Can't wait to try it. What kind of mushrooms are recommended? Saratoga Pixie: Button or cremini work well! Mushrooms are 1 of my favorite foods. Thus looks great. I wish you would give a serving size or let us know if it is just 1. I am a diabete & have to count every carb. Can i Make this the evening before? Linda: Yes you can make it the day before and rewarm it, of course it's best fresh though. I was wondering if I can use canned mushrooms. And if it works if i cook them on stove? Alana Springs: I have not tried it with canned mushrooms. They would not be the same but they would probably taste good. These roasted mushrooms were part of dinner tonight, and what a delicious part they were! Thank you … will fix this again. Going to try this today! I will serve it as a tapa for my friends 🙂 fingers crossed! if you want to use up some ground thyme instead of fresh, how much would i use? if i want to use up ground thyme i have at home instead of buying fresh, how much would i use? Cindy: Use 1/8 teaspoon ground dried thyme. Enjoy! YUMMY!!! I made these last night, and they were sooooo good! I didn't have any thyme, so I made them with rosemary, and we topped them with feta cheese. It's definitely a new favorite dish!! Thank you so much for sharing this recipe!! Super easy to make and delicious. I used button mushrooms and will try with cremini next time. Thanks! Could I assemble this, and store it in a xiploc overnight, then bake the next day? Or can I bake it, then reheat the next day?! Yes, that’s 1 kg of mushrooms! They shrink a lot when roasted. Enjoy!